The entrance can be easily mistaken for a private house. There is a tree lined road as an approach to the cemetery. Additional information: Daughter of Henry Hill Buick and Margaret Buick, of Alyth. Grave/Memorial Reference: Sec. A. Grave 9 South. Additional information: Son of William Edward and Alzina Davies; husband of Margaret M. Davies, of Dunbar, East Lothian. Grave/Memorial Reference: Sec. D. Grave 269 North. Additional information: Son of Mr. and Mrs. William Ferguson, of Mains of Creachies, Alyth. Born at Alyth. Additional information: Son of Jessie Findlay, of Tannadice, Angus; grandson and ward of William Howitt, of Tannadice. Grave/Memorial Reference: Sec. D. Grave 281 South. Additional information: Son of Robert and Helen Milne, of Alyth. Grave/Memorial Reference: Sec. F. Grave 441 Mid. Additional information: Son of John and Mary Reid, of 5, Losset Rd., Alyth. 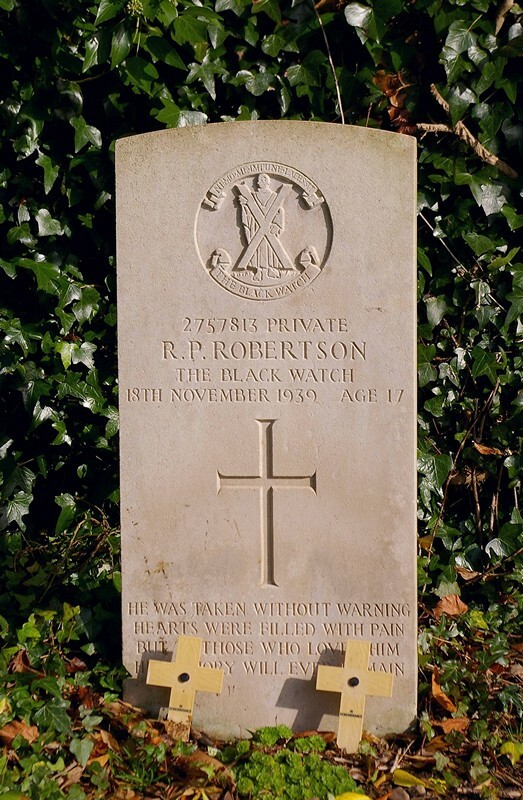 Additional information: Son of Robert and Mary Robertson, of New Alyth. Grave/Memorial Reference: Sec. E. Grave 415 Mid. Additional information: Son of William and Davina Taylor, of Alyth. Grave/Memorial Reference: Sec. A. Grave 23 South. Additional information: Son of Joseph and Matilda Whyte; husband of Margaret M. Thomson Whyte, of The Lodge, Bamff, Alyth. Born at Alyth. Also in Alyth town centre is a memorial to local casualties of the Boer War - whether or not their family plots are at Alyth Cemetery with any other information I do not know. Alyth's most famous WW1 veteran was the late Alfred Anderson of the Black Watch who lived to well over 100 until his death a few years back. am new to the site so still finding my way - I came across the Alyth Boer war reference on the site after I'd posted.